We extend our warm greetings to you. Congrats for approaching the best place for your Project based Industrial Training. 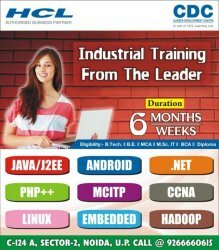 Industrial Training is an important part of professional job oriented courses like MCA, BCA, B.Tech etc. Most of these courses have summer and winter training as part of their course curriculum to enable students interface with Software Companies and bridge the gap between their learning as student in engineering college and working on real software development process as a software engineer. Career Development Centre (CDC), an initiative by HCL, enables individuals to benefit from HCL's expertise and become Industry ready IT professionals. HCL CDC is a formalization of this experience and credo which has been perfected over three decades. HCL CDC is offering Project/Industrial/Internship Training to the engineering & IT students to enable them become job ready and attain professionalism from the day they pass out from their academic institutions. Please find the details of training for your ready reference. In-depth knowledge of a technology in addition to the normal classroom teaching. Specialized knowledge of a technology, which provides the students with a platform to choose a career in future. Gives the students a chance to apply into actual practice the fundamentals and the concepts that they learn through the books. Skill Acquisition which the students can highlight in their CVs. Learning, Training, Case study, Presentations, Problem solving and Project Scenario. Hands on real-time project development experience. Exposure to software engineering practices. Eligibility: MCA / B. Tech./B.C.A /B.E /M.SC (IT & CS). Students get full fledged knowledge of technology which acts as a platform for them to get placed in a reputed organization. Placement assistance (Resume Formatting, Interview Preparation, Campus interviews. Free of cost Aptitude & PD training will be provided to all the candidates. 400 Strong Industry alliance team working for placements- Making huge opportunities for students. On successful completion of Project Training, HCL will issue Certificate of Completion & Separate Certificate for project work on company letter head after completion of the project. Certificate of Honor exclusively to the Best Trainee in each Batch. Web Space and Sub-domain will be provided to interested candidates to make the projects live on web at extra cost. There are 100 reasons to join HCL Learning, Join HCL CDC and feel the difference. Due to limited seats for the trainings. It is recommended to confirm a training seat in advance by depositing the initial registration fee. Please note that reasonable Hostel / PG accommodations available near our training location for outstation candidates. For any further query, registration process or guidance contact the undersigned.